Last year, when my book DJ: The Dog Who Rescued Me was published, after a two-year labor of love had been completed, sold, and released to the world, I threw a party in Chelsea to celebrate. We had booze (Pugatinis, in fact! ), we had portraits of my dog up on the walls, we had a raffle, we had a professional photographer, we had celebrities, and we had what was, in my opinion, a wonderful evening. 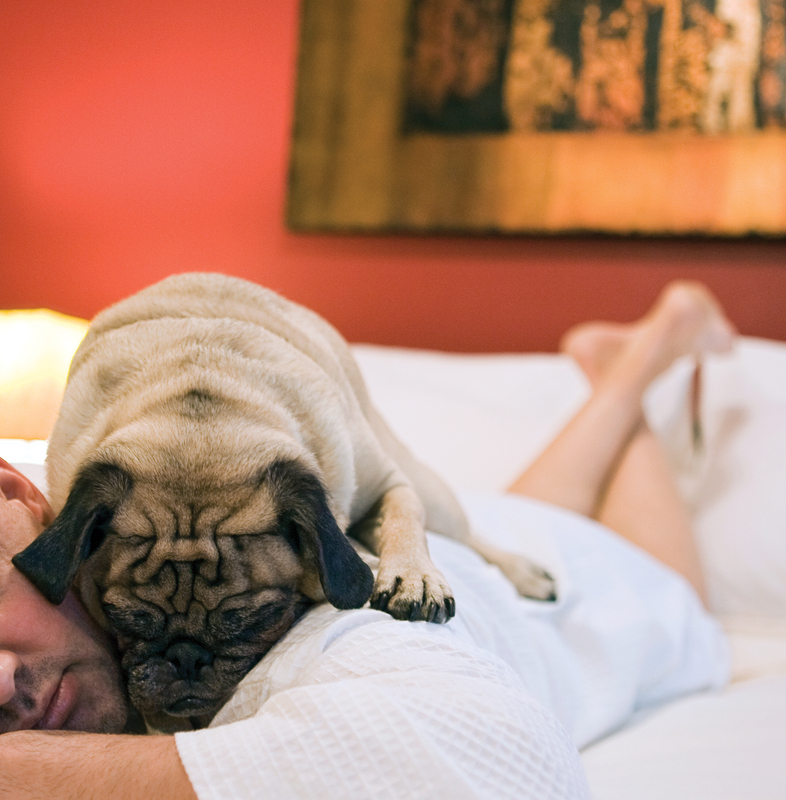 What we almost didn't have was DJ, my then eight-year-old pug who was the reason for all of the above. In my book, I accurately describe a six-year-old dog who leaps and spins and flies and jumps, who can spend hours at the local dog run playing fetch, who treats Tug-O-War as a matter of life or death -- not a game -- and who could outrun me on the street, my two long legs no match for his four galloping paws and ears flapping in the wind. A lot happens in two years, and a lot happens in the too-short life span of our dogs, our adopted children. Shortly before my book came out, DJ started having trouble walking, and even more trouble running to the park the way he used to, like a kid charging into Disney World once they open the doors. My first thought was arthritis, and after several neighbors confirmed the diagnosis (anyone who owns a canine knows that every other dog owner is a professional vet), I took him to see his real vet. For the first time in his life, DJ couldn't walk the ten blocks to the animal hospital and I had to put him in a taxi. The last time I'd put DJ in a taxi to take him to the vet was about a year previously, when I'd noticed a lump on his front right elbow bloom into what looked like a pimple to a flower bud in a matter of days. He had a malignant tumor, and the doctor removed it in time, telling me after the surgery that DJ was lucky I checked him so thoroughly. I didn't think I needed to add that DJ is 22 pounds, has short fur, and, that, as his guardian, I knew every spec of his frame. Still do. DJ has mild arthritis, but that wasn't causing the problems. DJ needed surgery on his spine, as he had disc disease, and, if left untreated, might eventually leave him all or partially paralyzed. In the meantime, the vet said I could take DJ to the book party, provided he stayed relatively still and did not go up or down stairs. He sat in my lap almost the entire time, sleeping peacefully or periodically planting a kiss on an unsuspecting guest. People oohed and awed at the pictures of him running in the Central Park snow, trotting among taxicabs downtown, playing with his three-legged Pit Bull friend -- activities that would be almost impossible to capture just two years later. My gut reaction to surgery was a resounding "No!" DJ is almost completely blind in one eye, and he survived his tumor. To put him -- and me -- through more procedures seemed unnecessarily cruel. And, loath as I am to admit it, he's getting older. Perhaps it would be better for him to enjoy the rest of his life cuddled up on the couch, not allowed to play with other dogs or toys or me. But he'd be free of more procedures and he'd be in his home. When DJ's walking got significantly worse, and when he started having accidents in the house -- a symptom of his nervous system not giving him the proper signals -- I opted for surgery. And I wanted it done before I had a chance to change my mind. I went to a specialist upstate, and it was four days of hell waiting for him to come home. When I took him from the assistant's arms, he panicked so much I had to struggle to keep from dropping him. It was crying mixed with whimpering mixed with what seemed an uncontrollable need to make sure I didn't leave him again. The people in the waiting room seemed stunned, not sure whether they were watching a reunion or a dog in the midst of a tragic accident. DJ came home, staples running down his neck, walking like a drunken sailor for several days. The surgeon informed me that this would be a natural part of the healing process, and it was both heartbreaking and heartwarming, knowing how confused he was and, at the same time, how dependent on me he'd become. My dog's surgery occurred a year ago this month -- Christmastime, almost exactly a year after his book came out. He's improved significantly, but he will never have the mobility he once had. Last February, I received permission to take him home to California, where I took him to a book signing in San Francisco and spent 10 days with him at the house where I grew up. On the first day home I placed him on my mother's lap, where he promptly stretched out and fell asleep. "He sleeps a lot, doesn't he?" Mom said, after joking that she'd have to stay on the couch all day. "He's tired," I replied. "He's spent his whole life being an athlete and now it's time for him to rest." I knew that I was viewing the natural aging process of two heavenly beings -- my mother is 82 and has spent a lifetime taking care of five kids and living a far more active lifestyle than I ever have -- and seeing them both resting, exhausted, filled me with warmth and sadness and love and an odd sense of serenity. They've earned their comfort, and the tranquility of relaxation can be breathtakingly beautiful to behold. And painful. When I was a kid of about 10, in that same house, I watched a pet rabbit die in my arms, convulsing, struggling for air and staring straight at me before closing her eyes forever. I looked at that almost-mythical animal, pitch black with thick fur, who maybe a week before had painted a picture of god's lush green goodness, eating grass on a suburban lawn, now fighting against our cruelest reality. I wanted to understand where she went because I knew I'd be going there at a later time. My only concern for DJ at Mom's home was the fear that he'd jump down the huge step to the sunken living room. Nope. Every time he wanted to explore that part of the house, which was pretty much anytime anyone visited the room, he stopped and whimpered. I would hear the "bell," and pick him up and place him on the floor. My mother has about 20 various rugs in her house and DJ managed to lie on each one at some point. He even scrunched up his body and slumped into a too-small basket reserved for a neighborhood cat -- DJ will seek out any new bed fit to be tired in. Back in New York my apartment is equipped for a Pug of a Certain Age. There are steps leading up and down the couch and the bed, and the food dishes are raised so he doesn't have to bend his neck. To my surprise DJ has come to abide by these new rules and, it would seem, enjoy them. After I got permission to play with him again, I've reinstated many of our rituals, but on a more age-appropriate level. We still play rapid-fire (or "Bootcamp") fetch, but only once a day, and, between you and me, I now let him win sooner than I used to. Tug-O-War is also more limited, as pulling on toys can strain his spine. Whereas I used to say "Movie Night" and he'd twirl and leap and jump up onto the bed, I now say it and then watch him slowly make his way to the bed, where he waits for me to pick him up. After about five minutes of kisses and chewing my T-shirt -- don't ask -- and going under and over the covers, he keels over and sleeps till the movie ends. DJ has to take four steps on his front paws for every two on his back, because of the weakness he still has in his spine. Long walks tire him out, and the hike to the park is out of the question. But we have adjusted. On nice-weather days, we sit on the front stoop in the morning, sometimes for an hour. I bring my coffee, and DJ watches and sniffs and takes in the neighborhood where he has spent his entire life. He's 52 in simplified pug-dog years, and when he sits up on the steps today he seems more of gargoyle to protect the building and its loyal occupants, guardian of his home, his city, his known world. Since he no longer has accidents, when we do get up from the stoop to walk it's usually because my bladder is giving me signals. Older dogs, like older people, aren't often photographed in cute calendars and in TV shows and, yes, books. And like older people, there is a special resilience in them that gives them more dimension and character. I no longer even try to make sure DJ understands what my words mean -- he's learned them all -- and if we don't yet look alike, we've become practically attached at the hip. He responds to all his nicknames as well as his actual name, he no longer even bothers trying to grab my attention when I'm holding that black thing next to my ear, and he won't even attempt to manipulate me into giving him table scraps -- friends who visit are a completely different story. When I walk DJ around the block everyone greets us and needs to say hi to him. When I walk alone, nobody seems to recognize me. I often joke that I live vicariously through my dog. I still work at home, and spend an exorbitant amount of time with my dog, time that grows more valuable as the statute of limitations shortens. Someone asked me not so long ago if I'd ever consider getting another pug, a companion for DJ. There are many reasons that won't happen, the biggest being that sharing my life with another dog would most likely break DJ's heart. We're buds, besties, stubborn creatures who more often than not prefer to spend a weekend snuggled up in bed with a movie than barking up trouble somewhere else. I turned 50 this year, which makes me officially two years younger than DJ, the dog who came into my life when he was three-months-old. If he rescued me then, from sadness and depression and loneliness and the sometimes selfish nature of human existence, I only hope I can return the favor as he enters his later years. It isn't watching our dogs grow older that brands our heart with the stamp of melancholy; it's that we watch them grow older than us.